Located Central Kenya approximately 155km north-west of Nairobi,connected by a sealed road, Lake Nakuru National Park can be visited on a day trip from Nairobi, although in the raining season more time would be needed. 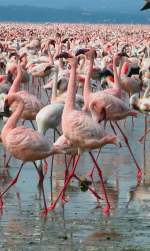 Lake Nakuru is a known ornithologists' paradise offering the spectacular view of up to 2 million flamingos at one time (during the season), which are attracted by the lake's algae. Sadly the numbers of flamingos have reduced over recent years, which may be due environmental damage caused by close human habitation. There are also hundreds of other species including birds of prey. 0700 Hrs. Pick up from Airport or Nairobi hotel and drive through the great Riftvalley to the famous home of Flamingo Lake Nakuru National park. It is 160 kms a 2 hours drive from Nairobi Have game drive at Lake Nakuru and lunch will be provided. Another afternoon game drive in the park. Return to Nairobi in the evening and proceed to airport for your International flight to South Africa.